When two users have permission to edit the same instance of form data (also known as a document), there is a chance that they might inadvertently overwrite and lose changes done by another user. This situation is illustrated by the diagram on the right. Say a first user, Homer, loads a document that contains "1" as the value of a field. Then say a second user, Marge, loads the same document. At that point, both Homer and Marge have the same document with the value "1" loaded in their browser. Now Homer can change the value from "1" to "2" and save. On her side, Marge can change the value from "1" to "3" and save. As result, Marge will overwrite the change done by Homer, and this without Homer or Marge knowing about it. A lease on a document is assigned to the first user, say Homer, who loads that document. 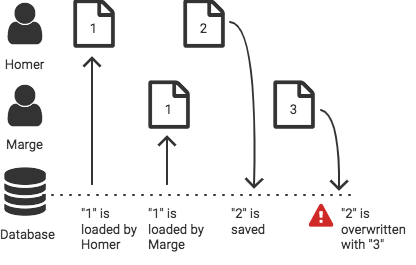 The lease is given to Homer for 10 minutes, so if he lets it sit in his browser, after 10 minutes another user will, in turn, be able to edit the document. The lease is automatically extended when Homer makes changes to the document. Should he want to, he can also extend the lease explicitly by clicking on a "Renew lease" button. 2 minutes before the expiration of the lease, a dialog asks Homer if he wants to extend the lease so he can continue to edit the document. Finally, Homer can also explicitly relinquish the lease so to give other users a chance to immediately edit that document. On the other hand, if a second user, say Marge, tries to edit the document while a lease was granted to Homer, then Marge is told Homer currently has the lease on the document, and is prevented from editing the document - this until the lease expires, or Homer explicitly relinquishes the lease. Of course, the lease system is optionally enabled, and all the durations mentioned earlier are defaults, and you can change them if needed. With the new lease mechanism in place, you can easily avoid situations when multiple users edit the same document, making your form solution using Orbeon Forms safer and more reliable. For more on this, see the documentation on the lease feature.